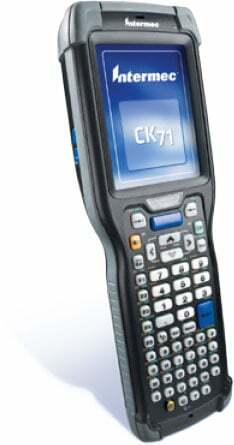 Intermec CK71 - WLAN Only, Alphanumeric Keypad, Near-Far 2D Imager Scanner with Auto-Focus, No Camera, Windows Embedded Handheld 6.5, ICP Software. Interface cables and charging cradle sold separately. USB Cable for dock (Part# 236-209-001). Single slot charging cradle kit (Part# DX1A02B10). Quad dock charging cradle kit (Part# DX4A2222210). The Intermec CK71 ultra-rugged mobile computer is 31% smaller and lighter than other form factors in its ultra-rugged class, plus it's optimized for warehouse and distribution environments for the perfect balance of ruggedness and duty cycle along with next generation features that focus on enabling flexibility and agility, even in the most extreme conditions. The CK71 features the industry's first dual-band 802.11n WLAN radio, delivering rock solid performance and consistently fast response times even in areas where you might experience low signal levels or intermittent connections with traditional 802.11a/b/g products. The CK71 also leverages Intermec's industry-leading near/far area imager, providing the flexibility to read both 1D and 2D barcodes without the need for specialized scanners. For highly dynamic environments, the CK71 also offers the industry's fastest imaging engine, capable of scanning barcodes moving at up to 12.7 m (500 in) per second, enabling the CK71 to provide remarkable tolerance to hand or barcode movement. The Intermec CK71AA4MN00W1400 is also known as Intermec Technologies	INT-CK71A68	.